So this Recipe Wednesday is not necessarily a homemade recipe but I wanted to feature a product I tried out a couple weeks ago when I was craving something sweet and absolutely loved it! I saw it on instagram, checked out their website and figured hey why not try it. 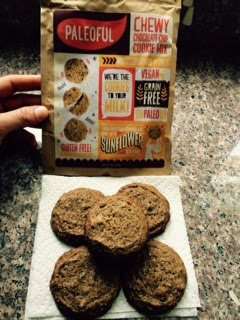 Paleo friendly, gluten free, grain free, vegan, egg free, soy free, non GMO. Seriously thought it was going to taste nasty as some other paleo products I have tried have been pretty gross. And yes, normally I do not get anything out of a box but figured again I wanted to give it a try. The ingredient list was safe and the cookies....well they were AMAZING!!! If you are in a pinch, definitely check these out!! They have nothing but amazing reviews! Protein Bites - Take 2! Conquering the month of MAY!